As of iOS6, Apple replaced the well-known Google Maps app with one of their own. And ever since its launch, there’s been strong controversy surrounding it. Map data and POIs have frequently been found to be inaccurate by users around the world and satellite imagery has been rather spotty, interchanging between high and low res, different times of day and even seasons all on the territory of one and the same town. The new Maps app has been rushed to the market and it’s far from ready for prime time. And that got the anger of users, who have been voicing their discontent online quite loudly (and originally, too). Apple’s competitors didn’t miss the opportunity to take a jab at the the quality of provided maps with both the Google-owned Motorola and Nokia making public their ill-concealed satisfaction from the situation. You would think that in times like these Google would jump straight ahead and release a dedicated native Google Maps to iOS devices? 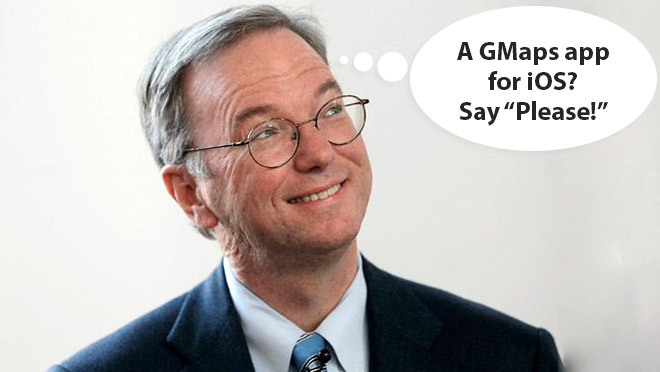 Well, not so fast, if you ask Eric Schmidt, one of the men at the top over at Google. In fact, Reuters has him quoted saying that “We think it would have been better if they had kept ours. But what do I know? What were we going to do, force them not to change their mind? It’s their call.” Schmidt also added that no Google Maps application has been submitted to Apple’s AppStore and that Google will be leaving the decision whether Apple would want one completely in Apple’s hands. This comes hot after rumors surfaced online that Google has indeed prepared a native Google Maps app and it has even submitted it to the AppStore for approval. And I gotta tell you, it really makes sense for Google to back off now and not do anything, letting Apple soak in the full publicity negatives of their solo move. Submitting a Google Maps app right now would only ease off the blow and allow Apple some slack to improve its Maps app. I can’t help but put myself in Apple’s shoes too. Going rogue and against the well-established online map authority is bound to make many users unhappy. But this was a logical step having in mind how they see Android as ripping them off and how Google Maps on iOS has been stalling in its development the past few years. History shows that a move like Apple’s may not be the best idea (Microsoft and its Bing Maps), but we also have evidence in the opposite direction as well. Nokia Maps for instance, has proved that competing successfully with Google in mobile maps is a feasible task. So what do you think? Is it the Google Maps’ way or the highway for Apple?